One of my favorite dinner moments this week was seeing the kids eat lima beans...and like them. Shocking! I think they've concluded there is no way out of mommy's bean challenge dinners. But the more likely reason they liked the lima beans is this: there was pancetta in it. We've avoided meat for our bean challenge the previous 26 weeks. This time we used meat like a seasoning. Week 27 was homemade refried beans; the last time I made them, they did not taste like I remembered from my childhood. I knew what the secret was, but I needed it to be confirmed by mi familia: bacon drippings or chorizo. Bacon drippings made a big difference in taste. I now have several tablespoons of solidified bacon drippings in the fridge. If anybody out there knows how long the lard will keep, please let me know - I have no idea. If you're looking for a vegetarian substitute and want to replicate the taste, try frying up some vegetarian sausage or vegetarian bacon in lots of olive oil, then use both in your refried beans. Now to the lima bean dish: A recipe from The Splendid Table email newsletter. 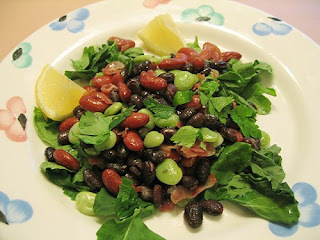 This was a 3 bean extravaganza: Lima, black, and kidney beans. It was very simple - warm up the beans in garlic infused olive oil (do this by heating up several peeled/crushed flat cloves), fold in a small amount of fried pancetta, top with some fresh lemon juice and serve on arugala. 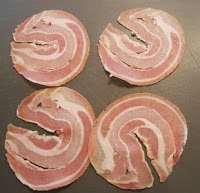 Only add salt if you think it needs some - pancetta is salt cured, so it may need no additional salt. Using meat these past 2 bean challenge dinners may be a slippery slope. Ideally, I'd like to keep these dinners vegetarian. I think the addition of the flavor made it easier for our daughter to tolerate. We'll see what the next few weeks bring. It looks beautiful. You get an A for presentation. Is it a Bribe? Or a Motivator? People must look at me and think "avocado"